On August 2015, we Setsuyo Enterprise Co., Ltd. presented FA-related products in the Taipei International Industrial Automation Exhibition held in Taipei. 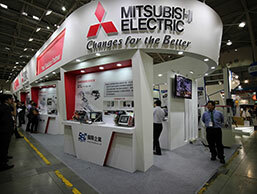 Around 350 companies attended this exhibition. With manufacturing automation as the main theme, robots, automation equipment, and other automation-related products were presented in the exhibit and this exhibition became a huge success. 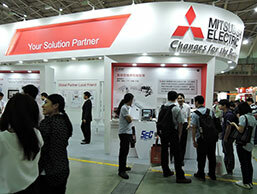 On the fifth year of participation, we introduced FA solutions (AC servo, inverters, graphic operation terminal (GOT) and its related partner products) through a joint exhibit with Mitsubishi Electric Taiwan Co., Ltd. Providing a clear and detailed presentation by fully utilizing the catalog and demo equipment, we received positive feedback from our main distributors and visitors. Through this exhibition, we had the opportunity to promote Mitsubishi Electric FA-related products and service systems to many Taiwan-based manufacturers in the LCD・Touch panel, semiconductor, and factory automation industries. 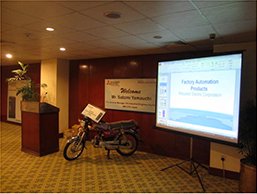 On February 27, 2015, IFA (Integrated Factory Automation Inc.), distributor of Setsuyo Astec Corporation in the Philippines, held a preview of Mitsubishi Electric’s FA (Factory Automation) -related products at Cebu Trade Hall in SM City Cebu. 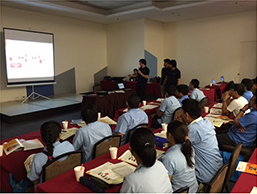 Featuring presentations of new products as well as demo equipment, the event became a success garnered the interest of many participants. IFA also promoted their Cebu office which opened last year. Mr. Satomi Yamauchi, General Manager of FA & Industrial-Engineering Department in Setsuyo Astec Corporation, attended the event and held a seminar on these new products. In addition to the new products such as iQ-R Platform, Inverter FR-A800,FR-F800 Series, and Graphic operation terminal, GOT2000 Series, the presentation also featured product replacement for current models (Q Series PLC for Compact PLC A Series, and MR-J4 Series for AC Servo MR-J2 Super Series), power monitoring equipment, energy-saving support equipment, and MC Works64 - SCADA system. For demo equipment, FR-A800 Inverter Series, as well as GOT2000 Display and AC Servo MR-J4 Series were introduced. 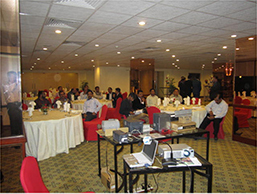 Prince Electric Co.,distributor of Setsuyo Astec Corporation in Pakistan, hosted two separate seminars featuring Mitsubishi Electric’s new products FR-A800, FR-F800 Inverter Series on March 14, 2015 at Avari Hotel in Lahore City, and on March 18, 2015 at Marriott Hotel in Karachi City. Mr. Satomi Yamauchi, General Manager of FA & Industrial-Engineering Department in Setsuyo Astec Corporation, attended the seminar as a lecturer. His lecture featured inverters, as well as power monitoring equipment and energy-saving support equipment. 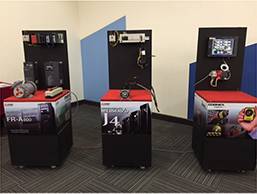 There was also an exhibit of demo equipment in the venue, which caught the much interest of many participants. 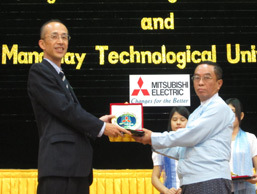 On December 11, 2014, Mitsubishi Electric Corporation Factory Automation System Group presented sets of teaching tool of their FX-PLC, Inverters and HMIs-GOT to Yangon Technological University and Mandalay Technological University in Myanmar. The presentation ceremony was a huge success with about 150 participants including Prof. NYI Hla Nge of the Myanmar Ministry of Science and Technology, university stakeholders, students, press as well as representatives from Peace Myanmar Electric, distributor of Setsuyo Astec, Mitsubishi Electric Corporation and Setsuyo Astec Corporation. 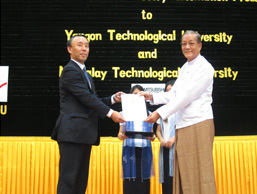 Yangon Technological University is in Yangon, Myanmar’s largest city and former capital while Mandalay Technological University is in Mandalay, the country’s second largest city. Both are known to provide the best technological education in Myanmar. Providing support for industrial development, the universities give not only theoretical knowledge but also training with practical education to future engineers in various industries both inside and outside the country. This is the third time in Myanmar FA-related products were donated, after previous donations to Myanmar Maritime University and TECH vocational and technical training school. Kohji Maruyama, General Manager, Yangon Branch Office, Mitsubishi Electric Asia Pte. Ltd.
Mr. Saw Aung, Managing Director of Peace Myanmar Electric Co., Ltd.